U.S. equities are recovering on Tuesday thanks to a steepening of the yield curve. Put more simply, the bond market is suddenly feeling a little less worried about the specter of a recession after long-term rates fell below a critical short-term rate recently. Stocks are taking their cue from this larger and much more important marketplace, helping the S&P 500 push back over the critical 2,800 level. Will the move above this threshold, which has confounded the bulls repeatedly since October, finally be definitively crossed? If it is, newfound strength in the energy sector will be a key driver. Quietly, hoping not to attract attention to itself, crude oil has been steadily gaining ground since bottoming in December. With the start of the summer driving season near, West Texas Intermediate is once more flirting with the $60-a-barrel level. The Energy Select Sector SPDR (NYSEARCA:XLE) is following suit, preparing for a move up and over its 200-day moving average. 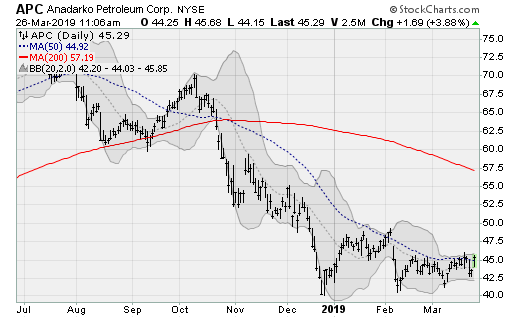 Shares of Occidental Petroleum (NYSE:OXY) are preparing to break up and and out of a tight three-month consolidation range as it extends away from a rising 50-day moving average. Next stop is a test of the 200-day average, which would be worth a gain of 6% from here. 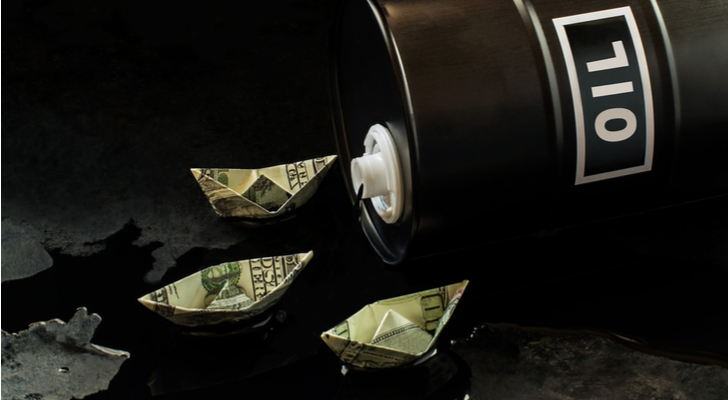 The company recently announced that it plans to double crude exports to 600,000 barrels per day in 2020. The company will next report results on May 8 after the close. Analysts are looking for earnings of 76 cents per share on revenues of $4.1 billion. When the company last reported on February 12, earnings of $1.22 per share beat estimates by six cents on a 33.8% rise in revenues. 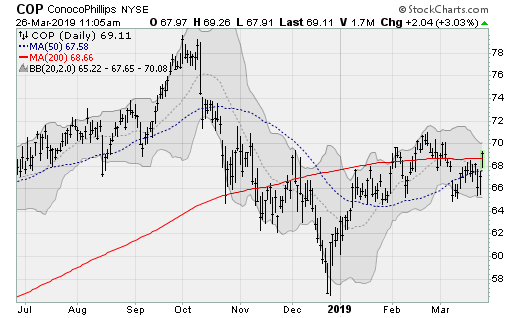 ConocoPhillips (NYSE:COP) shares are rising again above its 200-day moving average, returning to the upper end of a trading range going back to late October. Already enjoying a 20%+ rally off of its late December low, watch for a move to prior highs near $78 — which would be worth a gain of more than 14% from current levels. The company will next report results on April 25 before the bell. Analysts are looking for earnings of 76 cents per share on revenues of $8.5 billion. When the company last reported on January 31, earnings of $1.13 per share beat estimates by 11 cents on over $9.1 billion in revenue. 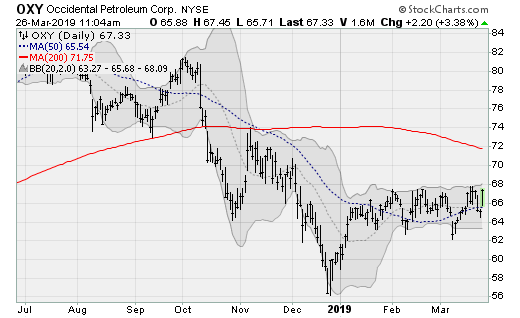 Anadarko Petroleum (NYSE:APC) shares are coiling up nicely within a four-month consolidation range, readying a powerful breakout that should see a test of the 200-day moving average. Such a move would be worth a gain of nearly 30% from here. The stock has been stock in a multi-year trading range, with resistance near $75 (first reached in 2011) and support near $40 (in place since late 2017). The company will next report results on April 30 after the close. Analysts are looking for earnings of 19 cents per share on revenues of nearly $3 billion. When the company last reported on February 5, earnings of 38 cents per share missed estimates by 24 cents on a 14.3% rise in revenues. 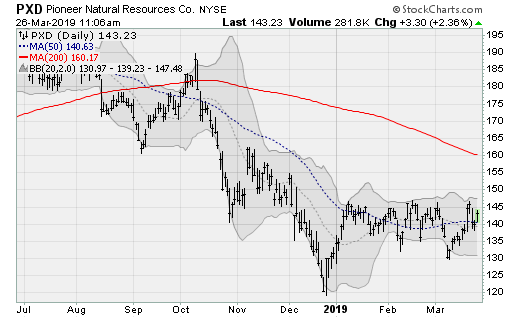 Similar to other names on this list, Pioneer Natural Resources (NYSE:PXD) is enjoying a solid base of support after months within a tight consolidation range that sets up a run at its 200-day moving average. Such a move would be worth a gain of more than 11%. Shares of shrugged off some bad news, including a downgrade from Mizuho on March 19. The company will next report results on May 1 after the close. Analysts are looking for earnings of $1.52 per share on revenues of $2.2 billion. When the company last reported on February 13, earnings of $1.18 per share missed estimates by 16 cents despite a 75.4% rise in revenues. As of this writing, the author held no shares in the aforementioned securities. Article printed from InvestorPlace Media, https://investorplace.com/2019/03/4-energy-stocks-ready-to-rally/.